The latest version (v1.9.624) with support for OpenSimulator grids is available via Android Market. I want to mention that OpenSim support is still in beta stage, so don’t expect all functions of Mobile Grid Client to work, especially teleporting and group handling. License payment still has to be done via Second Life, so you will need a Second Life account with some L$ to acquire one. Our service was not available today from 6:00 to 15:00 o’clock UTC due to a misconfiguration of the server. We are sorry for that. The problem has been fixed and should not occur again. You may also have noticed some updates of the client in the last days. The application did crash occasionally on some phones. We addressed that with the updates. Please give us some feedback via e-mail if you think something does not work as it should. We have introduced a new licensing model with prices starting at L$250 per month. 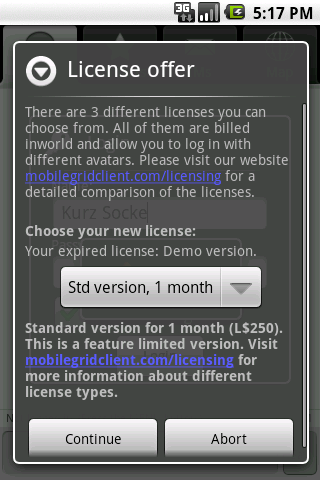 You can now choose from two different license versions, the Standard version and the Professional version. Main difference between those two versions is the background inactivity timer. The Standard version will log you out from Second Life after the application has been 15 minutes in the background. The Professional version allows you to to put the application in the background for up to 8 hours. But there is also a small feature limitation in the Standard version, see the comparison table under Licensing/Pricing for more information. Also new is the possibility to buy a Professional license for a whole year, which gives you a discount of L$900 (two months) over separately monthly paid licenses. The Demo version license has been extended to two full weeks (14 days) instead of previously ten days. All current active licenses have been classified as Professional version licenses. Support for SLurl.com and secondlife:// links was added. Clicking on a secondlife:// link (used by SLurl.com and other websites) now opens Mobile Grid Client and you will be asked before teleporting to the destination. Mobile Grid Client is compatible with small and big screen devices. For example the HTC Tattoo. We have improved the local chat: The entries now show how far your conversational partner is away from you, so you get a better feeling about your surrounding avatars. Some time ago Elroy Sullivan mentioned by e-mail, that he would like to swipe between different IM channels. This is my first try in gestures and animations, please let me know what you (everyone, not just Elroy) think about it. David Baril, also via e-mail, suggested the use of the full screen landscape soft keyboard, as long as there is the bug in Android that stops the dictionary from working with the other keyboard layout. This was added as an option in the preferences. 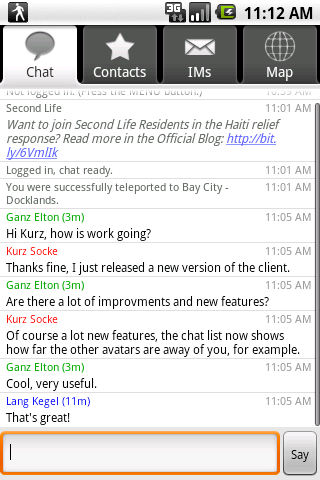 Finally we speeded up chat and IM lists a bit. 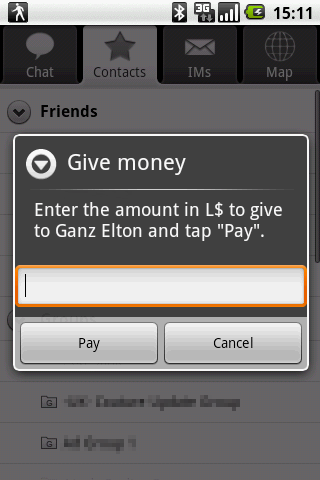 Some of you requested the feature to give someone money (L$) and therefore the latest version (v1.7.506) supports payments to avatars. You will also be noticed if someone sends you money. I hope you like it. The previous version (v1.6.472) introduced an issue with the friendlist, sometimes it did not update the online status. This is fixed now. If you encounter some problems (like the one with the friendlist) don’t hesitate to contact me via a comment on this site or via e-mail. 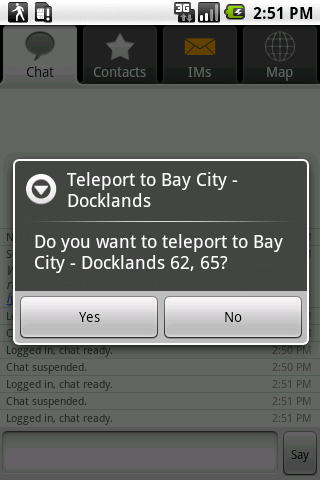 The new released version (1.6.452) now supports teleporting to avatars in the same region. 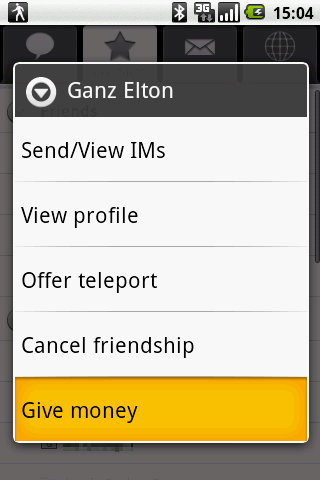 You will be teleported 2m to the east of the the selected avatar. This should make it possible to chat with everyone in the region and follow people to special places. I think it’s the best way to move without seeing. Also new is the group notice feature, but at the moment only the message itself is displayed in the appropriate group chat channel, the attachments are not saved to your inventory.